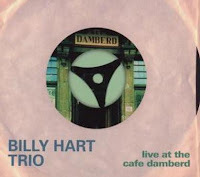 Billy Hart is without a doubt one of the most elegant and versatile drummers of the moment. In this live performance with Johannes Enders on sax and Martin Zenker on bass, his skills get the perfect context to shine. And the performance is good, with all three musicians getting ample time to solo, interacting well, with sufficient variation and moments of interest to keep the audience's enthusiastic attention. It is mainstream jazz, in a modern and creative version, very accessible without being boring: it bops, it funks, it swings. Enders and Zenker are more than good, and listening to Hart is a real joy. Nothing earth-shaking, but nice enough. If you're more into mainstream than I am, this one is highly recommended. Listen and download from iTunes.